It didn’t take long for Cabot Links to make a startling impact on the Canadian Top 100 rankings, soaring almost to the top of this prestigious national chart within months of its opening. Indeed, such was the impression made by Rod Whitman’s celebrated new course, it also entered the World Top 100 in a very respectably high position. No pressure then on Bill Coore & Ben Crenshaw to deliver when their much awaited Cliffs layout debuted three years later. Situated half a mile away from Cabot Links, the Cliffs course occupies a more diverse landscape than its predecessor, sitting atop the bluffs that overlook the Gulf of St Lawrence, with fairways transitioning seamlessly between woodland, wetland and meadowland areas. Somewhat unusually, the layout is configured with three par threes, three par fours and three par fives on each of the nines. Rod Whitman, who designed the other course at Cabot, had a hand in shaping some of the fairways, particularly on the par fives at holes 1 and 10, where he introduced the humps and hollows onto fairways that were previously as flat as a pancake. Integrative Golf was also involved in the building process, with Riley Johns (who had just finished on a project with Tom Doak in Michigan) and Trevor Dormer (fresh from completing a Dubai course with Gil Hanse) providing more shaping expertise. Keith Cutten should also be mentioned for completing the construction of the bunkers. Cabot Cliffs may well be the younger of the two siblings but what Coore & Crenshaw have done here is nothing less than magnificent. This seaside clifftop property must have been a real challenge to route a course through. The genius of Bill Coore not only managed that but at the same time put together one of the best new courses in the world and one that immediately takes its place among the world’s Top 100 greats. After a fairly gentle handshake Cabot Cliffs heats up already on the 2nd hole and gives you a taste of what’s in store. The 2nd is a short par 4 with an infinitely wide fairway. It’s a solid 60 yards below the tee and requires a well placed and measured tee shot. A hybrid or long iron for longer hitters, 3 wood for medium hitters and possibly driver for shorter hitters. We were instructed to play to the left side which requires a shorter carry and provided a nice kick forward down to the fairway. Most importantly it provided arguably the best look at the approach to the left center pin position. The green was in a horseshoe shape around a large dune, a unique concept. It’s also raised and sloping severely back to front – easy enough to hit but often leaving a challenging two putt. The next notable hole is the par 4 5th, which is a cape hole requiring an excellent drive with a high degree of precision. The drive is semi blind up over a slope to the right. A solid drive will run down the hill leaving a decent approach into a large green sloping severely right to left. This approach is made tricky, as it must be played from a right to left sloping fairway. A well placed approach right of the pin may just allow for a decent birdie opportunity. The par 5 7th hole may well be the toughest and most intimidating on the front 9. The drive is deceptive and requires a very accurate tee shot to carry the ravine. It has a heroic element to it with a bunker running down the right side daring you to take it on and try and make the carry. The hole is a definitely a 3 shot par 5. A solid drive finding the fairway will be challenged by the second shot which plays much wider than it looks. As we played this hole straight into the wind the approach, which plays over a low area to a raised green with a huge bunker on the front left side, was extremely challenging each time. After a solid start the back 9 really heats up with the par 3, 13th one of the most challenging 3’s on the course. Dealing with the wind this long 1 shotter plays to a tricky right to left sloping green that runs away diagonally from the line of play. At 200+ yards this will be as much as even the best players can bite off. The par 5, 14th is a reachable par 5. A solid drive taking on the mound on the left side will receive a forward kick leaving a steep downhill approach into a green sloping severely front to back. Reachable as it is I never managed more than a 5 on this hole as putting and chipping around the green requires significant touch. The iconic 16th hole is the crazy cliff top par 3 playing over the sea to a sliver thin green running perpendicular to the line of play. Adding to the challenge is the wind and the fact that the green is semi blind with the exception of the far right pin position which you can hope you don’t have to deal with. The 17th may well be one of the most crazy and spectacular blind tee shots you will ever play. Some argue it’s too extreme but I think it adds to the dramatically spectacular finish at Cabot Cliffs. It’s hard to explain this hole but imagine standing on a cliff 150 ft above the crashing waves then playing your tee shot out over the abyss and across to a fairway that slopes steeply away from the line of play down to a green some 50 ft below. From the tee all you can see is the edge of the opposite cliff that runs from the high point on the left down and diagonally away from the tee box. The fairway and tee shot are blind, it’s a cut off as much as you can chew with an opportunity to drive the green on this short 4. A deep bunker fronts the green, shots that veer left and come up short, even up to 100yds short, can be putted down the steep slope around the front bunker. A fun shot to watch your putt break 30-40ft left to right and end up near a back right or front right flag. The 18th brings you home along the cliffs and ocean in truly breathtaking fashion. A solid drive allows for a chance to take on this green in two. A great risk reward par 5 to rap things up. Cabot Cliffs in my view steals the show and remains one of the best contributions of Coore & Crenshaw to the golf world to date. It’s the perfect 1,2 punch to keep the golf world returning for more. Since the opening of the first 18 called Cabot Links -- the focus of the golf world has turned its eye to a location in Canada to the province of Nova Scotia -- which translates to New Scotland. The sequel to the Links courses -- The Cliffs opened in July of 2015 and I was on hand to play just a few days after the official opening. The Cliffs is aptly named occupying land roughly 100-200 feet above the Gulf of St. Lawrence and provides for much more rolling terrain than the Links. Given the involvement of Mike Keiser -- the man responsible for the development of the highly successful Bandon Dunes Resort in Oregon -- it was clear different architects would be engaged given past success when doing so. Ben Cowan-Dewar, the brainchild for the golf course development, knew early on the special character of the land for the Cliffs 18 and like Keiser wanted the heralded duo of Ben Crenshaw and Bill Coore to create it. This talented twosome has demonstrated a high degree of success with projects accentuating classical designed themes. Such notable works include Sand Hills in Nebraska, Friar's Head on Long Island, New York; Bandon Trails in Oregon; Clear Creek in the Tahoe area, to name just four -- along with highly successful restoration efforts at Pinehurst #2 in North Carolina and Prairie Dunes in Kansas. Just recently the two were hired to do similarly at famed Seminole in North Palm Beach, FL. Far more often than just about any other architects in the field -- Crenshaw and Coore turn down more offers than accept. For them -- the site and ownership have to be really special for them to say "yes." One of the interesting dimensions of The Cliffs Course is that there is an equal number of par-5, par-4 and par-3 holes. That means no more than six (6) par-4 holes and frankly it hurts the overall result in providing maximum hole differentiation. The opening hole is fairly benign par-5 581 yards -- meant to get the muscles loosened. Playing into the prevailing summer wind can mean a fairly stout hole but with the firm turf the opener is simply meant to get the players on their way. At the 2nd -- the architectural elements leap off the charts. You begin the hole from an elevated tee -- a fairway is wide enough to have several football games going on all at once. Again, the prevailing wind is in one's face and the key is securing the proper position for the approach shot. The green reminds me of the approach shot one faces with the 2nd at Pine Valley -- elevated to a demanding green with a plethora of vexing twists and turns. Players have to decide at the tee what angle for the approach is preferred. A down the middle tee shot is clearly safe but it ensures nothing depending upon the pin location. The green is elevated so being able to hit the proper club is mandatory. Having the right yardage is not enough -- the players must feel the shot and provide the correct trajectory to secure the best of outcomes. When the pin is cut tight to the front left or right you need to apply the highest level of shotmaking. The word superlative is often vastly overstated but in my cumulative golf experiences the 2nd here is riveting. The par-4 3rd is a good transition hole and while it plays away from the Gulf of St. Lawrence it pays to make note of where the pin is located to ensure the best angle into the green. The 4th is one of the best par-3's at the Cliffs. There's two greens designed for the hole and while the left one is longer -- about 225 yards -- it's the right one that is fiendish -- especially when the pin is cut tight towards the front. The next three holes show the collective skills of Crenshaw and Coore. The 5th is a risk/reward short par-4 that is smartly done with a tempting left side carry for the strong or foolish. The par-3 6th looks like a hole from Ballybunion's Old Course -- set in a bowl-like setting. The par-5 7th is arguably the best par-5 at the course. The tee shot requires a carry -- the closer one plays to the right the greater the effort is required. When you walk the fairway you will note the amount of undulation that's been provided. At Cabot Cliffs you rarely get massive stretches of fairway that don't have internal movement or predictable flat lies at all times. So many other practicing architects should take note of this invaluable feature. Unfortunately, the 7th, which is also a par-5 -- would be best played as a long par-4. The demands as a three-shot hole are fairly routine -- the saving grace is the putting surface which features a Biarritz green so getting to a rear pin location is clearly a challenge. The short par-3 8th is simply a connecting point between 7th and 9th holes. Crenshaw and Coore have created a number of top tier short holes in their illustrious career -- the 17th at Clear Creek comes to mind -- ditto the qualities of the 5th at Bandon Trails. The 9th here at the Cliffs is mainly vanilla. The back nine doesn't start next to the clubhouse -- the long 10th provides players with a return to the starting area. While the hole does have a pesky ravine that crosses in front of the green - the design elements are mainly on the low octane side of things. Candidly, the combination of holes at #9 and #10 could have been possibly reworked to provide for a better variety of sorts -- possibly two par-4 holes of note. The final eight holes provide top quality terrain and shotmaking requirements. The 11th green sits in a saddle and the uphill nature of the hole can distort club selection. On paper it looks like a simple hole -- it's more complex than many realize. The par-3 12th is a stout hole -- just under 250 yards and the wind direction velocity determines much. Hats off to Crenshaw and Coore -- many might think a miss to the left provides for an easier escape -- the reality is that the right side -- even in the greenside bunker -- provides more elasticity to escape with a three. At 398 yards the 13th will prove to be un-lucky for many players. The land forms provided are quite compelling -- topped by an approach shot that again must be hit with total purpose or face a likely punishment of bogey or worse. The hole plays uphill away from the water but the effective yardage is likely to add anywhere from 15-20 yards to the total. The 14th is a fine par-3 but doesn't add much to the total equation. It's more of a "connector" hole. I am a big fan of the downhill par-5 15th -- the contouring of the fairway makes for a tough decision at the tee. Under favorable conditions is reachable in two for the strong player. As you walk over the brow of the hill you see the green in the nearby distance -- with the Gulf of St. Lawrence set in the backdrop -- grand stuff indeed. When you reach the 16th tee you come one of the finest par-3 holes in all of golf. That may sound a bit lofty but I am confident in saying it. The sheer beauty is joined at the hip with non-negotiable demands. The hole plays 176 yards but once you hit your approach the lump in your throat will be noticeable. The green is set on a promontory that juts out high above the Gulf of St. Lawrence. From the tee the green provides more room to the left and there is space for the pin to be based far right. When located there the landing area is akin to a plane descending upon an aircraft carrier. The brakes had better be working. Interestingly, the architects believe the far left pin is the more demanding because of the contouring of the land that makes keeping a ball in that area more problematic. Just when you thought things could not get much better -- you come to the 17th. One of the real strengths of Crenshaw and Coore is knowing hot to create short par-4's that soar high off the charts -- using terrain to maximum effect and overall strategy. The hole slides to the right -- following the coastline - and plays uphill from the tee. Be forewarned -- the carry is much longer than it appears. The prudent play is to aim a bit more left and allow the contouring of the ground to roll the ball towards the green. Naturally, the architects -- being the clever people they are -- have added a bit more consequence into the equation. The green is protected by two frontal bunkers -- not especially large but like fire ants can bite quite painfully when called upon. For the player in the range of 75-100 yards out from the green the pitch over them will certainly create a "diaper moment." The 18th, a closing par-5, is done well as it parallels the coastline. However, I view the hole as anti-climatic after such searing memories come from the preceding two holes. A closing long par-4 in the league with either the 9th or 10th at Pebble Beach could have been accomplished and served as the perfect counterpoint to what one faced at the 15th, 16th and 17th holes. Likely, the architects wanted to provide one final good opportunity for a closing birdie -- I was hoping for something much more to close out the round. Credit the architects in creating a serpentine green that adds a saving grace to the hole -- especially timid players shying away from the coastline with their 2nd shots. The sad part during my time at the Cliffs was the fescue greens. They were especially slow -- as in S-L-O-W -- full shoulder turns needed to get a 10-footer to the hole. Slugging is not putting. No doubt playing a new course means conditions will not be ideal. But, on the flip side, when anyone opens a course it's best to have things in somewhat proper working order. I heard similar tales from people who played the course in '16 -- so it does bear watching. A quality green speed accentuates the design elements -- not have them neutered. There's been mention by some that the Cliffs is on par with such places as Sand Hills and Cypress Point. Clearly -- the pro Crenshaw / Coore enthusiasts -- are getting a bit ahead of themselves. The two aforementioned layouts easily make any top dozen courses in the world. The actual position of The Cliffs will need a good bit more time to sort out where it ultimately is positioned. The Cliffs provides an rousing intersection of land and water. But the lack of a wider variety of par-4's inhibits a far greater menu of holes. Trying to create six par-5's and an equal number of par-3 holes is more of an exercise in fulfilling a self-inflicted need when the land could have been better served otherwise. Let me add there is no set formula on what type of holes or the pars they have needs to be. However, the self-imposed desire to provide just six two-shot holes -- strikes me as short sighted and speaks to a desire to complete a bucket list accomplishment. The ebb and flow of the land makes for a range of shotmaking situations in which the golfer will need to make constant adjustments -- never allowing the player to get too comfortable. Crenshaw and Coore have clearly created a fun layout -- but greatness, in my mind, is about the thoroughness of the examination. In all likelihood I will need to return and play it again -- hopefully, when the putting greens are more functional than my first time around. The two Cabot courses will clearly have their fan groups. I view the original Links Course a more consistent and testing round of golf. The Cliffs is more about specific individual moments -- pushing the emotional buttons is what Crenshaw and Coore do so well. And make no mistake about it -- there are a number of holes at The Cliffs -- that like a stirring movie -- will have you on the edge of your seat. Just don't spill the popcorn. Combined together -- there are few 36-hole complexes in all of golf -- that can make for such a grand time. Cape Breton Island is now clearly high on the radar screen for golf aficionados and in reading this review the question should not be "if" you go but more like "when" you do. I agree completely with this, Cape Breton is not to be missed by golfers looking for something really special. Cabot combined with Highlands Links is one of the best trips I've ever made. Cabot Cliffs is as good as any. That's a pretty strong statement coming from someone who has had the pleasure to play 7 of the top 10 on top 100 list and 13 of top 20. The Cliffs is a mix of 6 par 3/4/5's. Every hole is special. Two holes I would change. The 9th is a short 3 which feels like it was jammed in to complete the 9. On the back the par 3 12th is just too much of a tilt. One of my 4some shoved their shot 40 yards right.....When it finished 10 feet away we all were stunned. I would trade out some increase yardage on 9 for some decrease on 12. Other than those two there are 16 very good to great holes. I believe the signature hole is 17. A roller coaster up and down par 4 which requires a tee ball that climbs 40 feet to find the fairway as the cliff wall stairs at you. Sublime. 16 is a treacherous 3 over that same cliff as in juts in. 2 may be the best hole. It is laid out with elevated tee to fairway that starts tight and expands to right. Go left or go long. The green is sinister tucked behind a huge bunker over a pond with a devilish mound in the green. 3 great sliding left. 5 is a huge dogleg left with pond to go around. How much can you bite off. The par 3 prior has a double green left/ right...great hole. A redan like 3 6th hole is nice but the 16th best hole. 7 forced carry 5 which looks more intimidating than it is. 8 is a good par 5 with fairway bunkers causing concerns for all shots. 10 a good par 5 hugging the cliff on the left and having some diabolical fairway bunkers which get visited often. Then you must cross the cliff to enter the green. 11 climbs up hill good hole. 13 nice dogleg right... don't go right.huge depression and overgrowth..15 a good 5 with more room than appears. The clubhouse....Yurts.,Is unique....The chairs placed in grass around 18 green and 10 green and 11 tee.are quite unique. The Links combines with this to create a substantial 1 2 punch. Visit Highland Links an hour away for a year Tribeca. But the Cliffs is the magnet. The 18th is a great finish. Some forced carry as cliff edge on right juts in twice. Once in front of tee area and once near 2nd shot. Par 5 with cliff all the way on right. Tree stand area comes into play in landing area of 2nd as well. Very good finisher. I played Cabot Cliffs in early September and I must say it is nothing short of absolutely marvellous. There are of course no weak holes, just one stellar hole after another. And there is also the very comforting feeling that you always know where you are on the property, the course is not a maze. Definately one of the very best I've played. Played Cabot Cliffs in October just before it closed for the winter. It is truly a gorgeous and great golf course. But I may differ from many others in my opinion that the three closing holes are not as strong as the rest of the layout. To me they felt a bit shoehorned into the landscape and not as much golfing enhancements to it like the 15 holes that preceded them. I will say the par 5 15th that leads you to the close was my favorite hole and an unforgettable mix of scenic beauty and golf in all its glory. I think this hole gets my vote for instant admission into the Golf Allure/ Architecture Hall of Fame. I played Cabot Links first and was impressed and exhilarated. The following day I played Cabot Cliffs and was absolutely blown away. Cabot Cliffs lived up to my anticipation. So many great strong holes. Even the unconventional ones had charm. The routing was a great use of the terrain. The elevation changes, unlike so many other courses, are utilized with great vision by Crenshaw/Coore. And, so many options so that it is playable regardless of the conditions. The wind was reversed between the first and second day. The course had to be played differently on each day in order to score. Through the air, along the ground, using slopes. Just fantastic. My favourite hole was the par 5 7th, a tee elevated over marsh land to a fairway that is elevated on the other side. My next favourite was the par 5 15th playing towards Margaree Island. Just fantastic. And then the stellar 16-17-18 finish. This is Canada’s strongest contribution to the great courses of the world. Prior to this, Canada’s best courses were target-orientated private clubs and somewhat bland (in my opinion relative to what there is elsewhere in the world) Stanley Thompson resort layouts. I wish I could have stayed a week and played it in more different types of weather conditions to find out what kind of other puzzles the layout would throw at me. (Also, everything that is right with this course being next to the ocean contrasts to everything that is wrong with a place like The Links at Crowbush Cove across the strait on Prince Edward Island). Wow! That’s my reaction to Cabot Cliffs. Though Coore and Crenshaw were given a mile of spectacular clifftop land to work with, they also got 3 sizeable wetlands. Moreover, many acres of forested upland also had to be used to create 18 holes. They came through with flying colors. Sand Hills may be a better effort than this one, but I can think of no other work of theirs that I like more. The greens are heavily contoured and huge: six of them are 45 yards or more in length or width. I place this course in my pantheon of modern links-style design, rivaled only by the 3 at Bandon Dunes and Lost Farm. With the official opening not scheduled until 2016, I was among a limited number playing in the summer of 2015. The fescue fairways had grown in nicely and I found only one lie where I’d have preferred to prefer. The greens were true as well, although quite slow, measuring 7 on my stimpmeter. It’s already quite firm and will make for an even more challenging test once the grass is cut further. 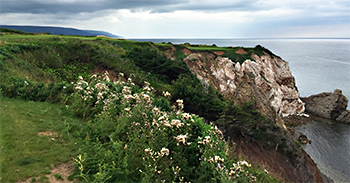 (As a matter of contrast, Cabot Cliffs was in better shape prior to its official opening than Trump International was two years after its official opening.) My 6 ball rating makes the likely assumption that conditions will have improved by the time it opens officially.